Winespectator 93-96: "Intense, this features notes of peach, pear, apricot, quince and mango, layering them deftly while the creamy finish picks up light ginger and almond accents. A big wine." -- J.M. James Suckling 93-94: "A lively and bright Sauternes with dried peach and apple aromas and flavors. Full body, medium sweet with botrytis spice and character at the finish." 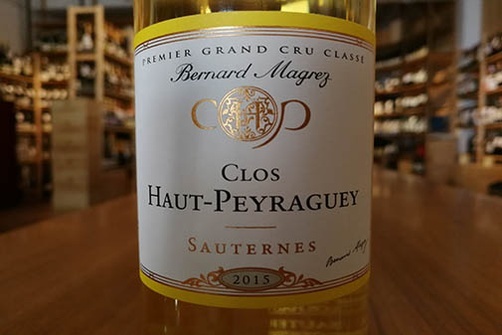 Antonio Galloni 92-95: "Candied orange peel, crème brulée, vanillin, pineapple and apricot jam meld together in the 2015 Clos Haut-Peyraguey. Deep, rich and unctuous - but with all of the finesse of the vintage - the Clos Haut-Peyraguey exudes depth, texture and pure class. The blend is 95% Sémillon and 5% Sauvignon fermented in French oak barrels. Tasted two times."